Addie's Journey | This blog is dedicated to our sweet girl, Addie. On July 15, 2008 she was diagnosed with a cancer known as hemangiosarcoma – a rapidly growing, highly invasive, blood fed sarcoma. 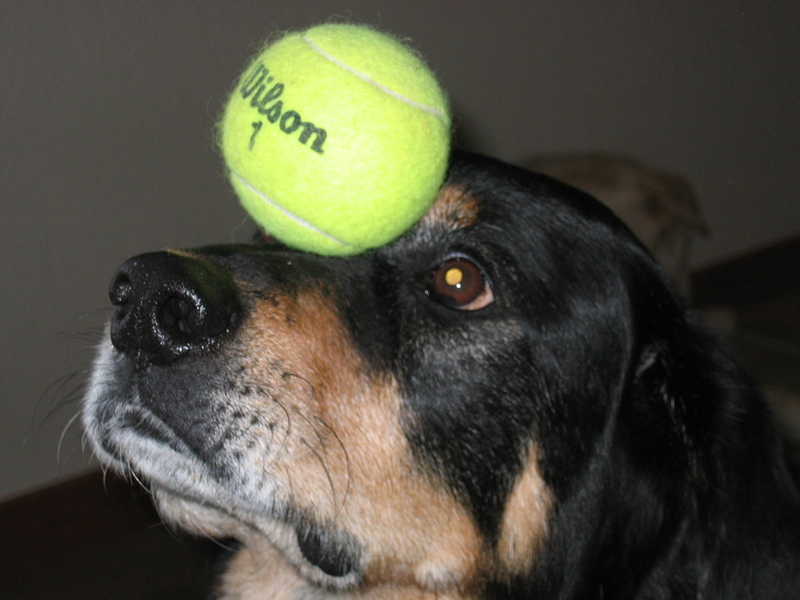 On June 7, 2013, almost 5 years after the diagnosis, Addie, a 70 pound Rottweiler mix, passed away aged 15 years, 7.5 months. This blog will remain here as a silent tribute to Addie's successful fight, with the help of Neoplasene, against a cancer that usually kills within two months. This blog is dedicated to our sweet girl, Addie. On July 15, 2008 she was diagnosed with a cancer known as hemangiosarcoma – a rapidly growing, highly invasive, blood fed sarcoma. 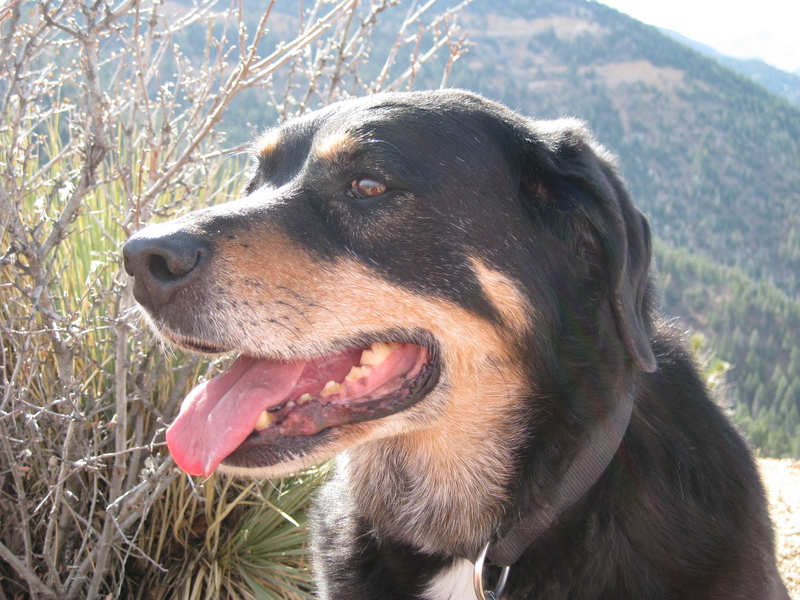 On June 7, 2013, almost 5 years after the diagnosis, Addie, a 70 pound Rottweiler mix, passed away aged 15 years, 7.5 months. This blog will remain here as a silent tribute to Addie's successful fight, with the help of Neoplasene, against a cancer that usually kills within two months. We knew from the time that Addie started taking Prednisone (and not taking Neoplasene) that there was a good chance that she might succumb. Unfortunately, what we feared did come to pass. However, without the Prednisone we would have lost her sooner as she could barely walk and would not eat. The Prednisone gave her several more weeks of relatively pain-free and enjoyable life. For this reason we do not regret the decision that was made. During the last day of Addie’s life I was not here to be with her. I had left to make a long overdue family visit and had left Denice here alone with the dogs. We had originally planned to travel together but I knew that we couldn’t leave Addie in the care of someone else given her fragile condition. I couldn’t bear the thought of neither of us being with her if she were to have passed while we both were gone. So, I stayed behind to care for Addie while Denice traveled and Denice stayed here while I was away a couple of weeks later. During the morning of the 7th of June, a mere two days into my absence from home, Addie collapsed. Denice was able to load her into our vehicle and rush her to our veterinarian. Dr. Ana evaluated Addie, determined that she was extremely anemic, and sent her for a chest x-ray. After the x-ray was taken, Addie’s condition worsened dramatically and the decision was made to euthanize. The next day, Denice buried Addie with her tennis ball on the banks of the lake near our home. I returned several days later knowing that I would not see my girl again. What typically happens to hemangiosarcoma patients who have had emergency splenectomies is that the cancer spreads via the bloodstream to another internal organ where another tumor grows and ruptures. This process usually occurs within 4-6 weeks after the splenectomy and is fatal. For nearly 5 years Addie successfully avoided that fate while she underwent a Neoplasene regimen. Addie stopped taking Neoplasene in favor of Prednisone on April 29, 2013. 5 weeks and 4 days later she passed away. The veterinarian who took Addie’s last x-ray confirmed the presence of an internal mass. We believe that the mass was a tumor that had probably started to grow after the Neoplasene was discontinued and eventually ruptured. Was Neoplasene responsible for giving Addie that 5 years of additional life expectancy beyond what we were told she would have after the splenectomy and hemangiosarcoma diagnosis? You must decide for yourself. It is our hope that Addie’s experiences with hemangiosarcoma and Neoplasene (which we have tried our best to document here) will continue to offer hope and real results for others who struggle to find a way to help their pets live with this cancer. 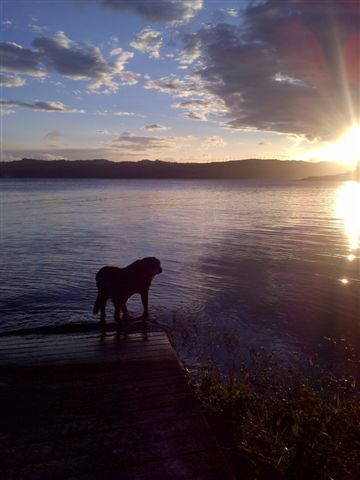 For this reason this blog will remain here in silent tribute to our faithful companion and the life she led. We will still receive notices if anyone wants to make a comment and/or ask questions of us through the blog. We are more than happy to continue to help if possible. In this way, we hope Addie’s legacy will live on. To Dr. Friedly and Ione at the Natural Healthcare Center for Animals in Falcon Colorado for everything you did for Addie during the time we lived in Colorado and afterwards. To Buck Mountain Pharmaceuticals for producing Neoplasene, taking the time to speak with us about how to administer it, and for helping us find a way to obtain it. To Addie’s veterinarians in Costa Rica, Dra. Leandro, Dra Ana, and Dr. Mario. To our family, friends, and all of you who followed Addie’s Journey. Addie – We hope we were worthy of your devotion. You were our baby girl and always will be. Words cannot express the deep sorrow we feel. But we are comforted by the knowledge that you can now run free, chase tennis balls endlessly, and swim forever. 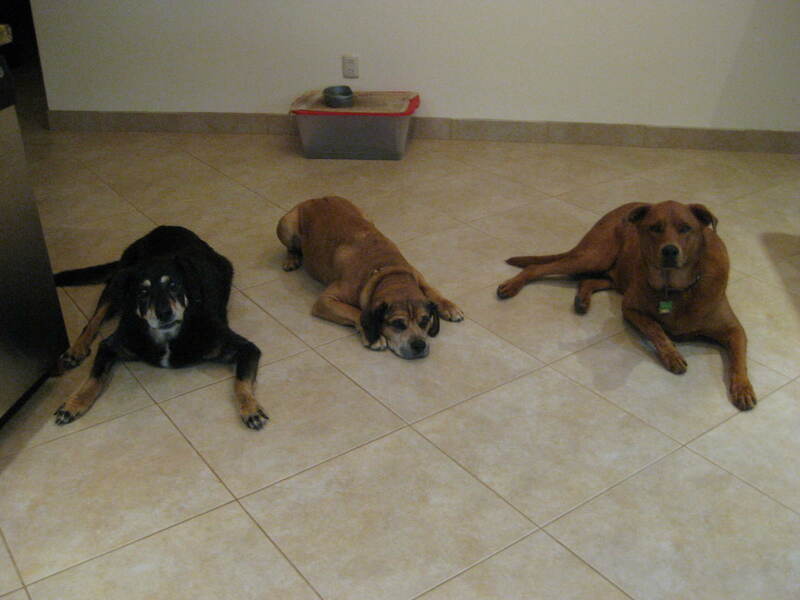 Addie, Tajo, and Finigan all waiting patiently for dinner behind “the line”. We have been very concerned about Addie for the past several weeks. As previously mentioned, the prednisone has been helping her to move and eat, but she still was not wanting to eat her full breakfast. However, about 4 days ago, a change occurred and now she cannot get enough to eat. She cleans not only her dinner bowl spotless but also her breakfast bowl! This seemed to coincide with our reducing her prednisone from 1 tablet each morning to 3/4 of a tablet. Not sure if that is a coincidence or not. We will keep her on 3/4 for 8 days, then 1/2 tablet for 8 days, then 1/4 for 8 days, then she should be finished. We are hoping that as we ween her off the prednisone, she will continue to eat and move well. Hopefully, we can get her back on the Neoplasene within the next 3 weeks. The only issue we are currently battling with her now are 2 “bed sores” she has on her hind legs from laying on the tile. They have both opened up again and she wants to continuously lick them. It is quite the battle to keep them medicated and covered so she cannot access them! We know that we truly are on borrowed time with her. And more often than before, we go through the quality of life checklist to make sure we are doing the right thing. It is so very hard to ensure we are keeping her comfortable and happy and not prolonging her life for our benefit. Today, we still believe we are doing the right thing…. Since Addie’s life threatening bout with Ehrlichiosis she has been on a regimen of new medicine. These include an antibiotic, antacid, vitamin, and a steroid (Prednisone). Yesterday, at her 2 week, post-Ehrlichiosis checkup the doctor drew blood and assessed her overall condition. She advised us to remove the antacid. Normally, I think the Prednisone would also be removed but without it I don’t think Addie would eat nor could she walk. At this point, I think it is primarily responsible for her being here. So, the doctor agreed and we decided to keep her on it for a while longer. Her blood test results came back today. Although they are better, her red blood count is still not where it needs to be. We are hoping that as soon as the antibiotic treatment is completed (another 7 days or so) that her red blood count will be normal so that we can try to wean her off the Prednisone. Prednisone is an anti-inflamatory and renders the Neoplasene ineffective. This is quite worrisome to us and we want to get her back on the Neoplasene if at all possible. However, at this point we would rather have her eating and walking. Just a few days without food at this stage would probably be fatal. So we take the lesser of two evils and hope for the best. Right now she is lying on the floor beside me and I can tell she is hungry. This is a good sign and I am happy to have it. Last week we realized that Addie had not had a blood test in over a year. Honestly, we had only requested one test since we moved to Costa Rica. So, since we were taking her to the vet to have her skin condition evaluated we figured we would also have blood drawn. Her test results were pretty good. Two categories are “above normal” but only slightly. In comparison to her past 3 blood tests she is actually much closer to the normal ranges now. Yeah! This past Sunday she was having a much harder time getting up than normal. However, she was eating normally and we felt that this was a good sign. Eventually though, she wasn’t even able to stand on her own. By Monday morning she was much worse and we sent a text message to our vet asking for an appointment. 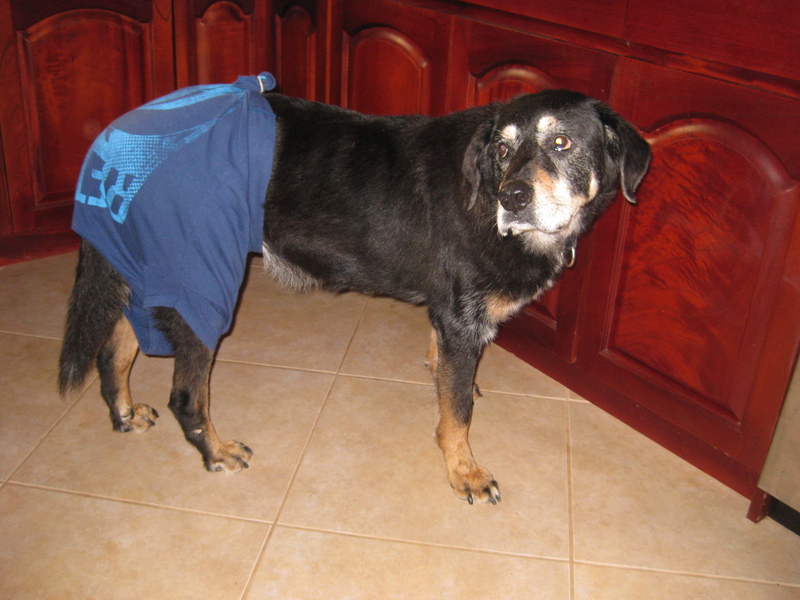 Unfortunately he was out-of-town but he did put us in touch with another vet in Tilarán. We took her in first thing Monday morning. We never know what to expect when Addie has to take an emergency trip to the vet. On several other occasions we have rushed to the vet thinking “this is THE trip”. We never want it to be but it is hard not thinking about that outcome as she is lying in the back of the vehicle in bad condition. By the time we arrived she could hardly raise her head and her breathing was very shallow. During the exam the vet even said “I am not optimistic at all about Addie’s prognosis” but then again, we have heard comments like that on several other occasions. The vet decided to insert an IV for hydration, to administer some pain medication, and to take a blood sample. Later that day she called to tell us that Addie needed to stay overnight BUT that she was recovering faster than anticipated! 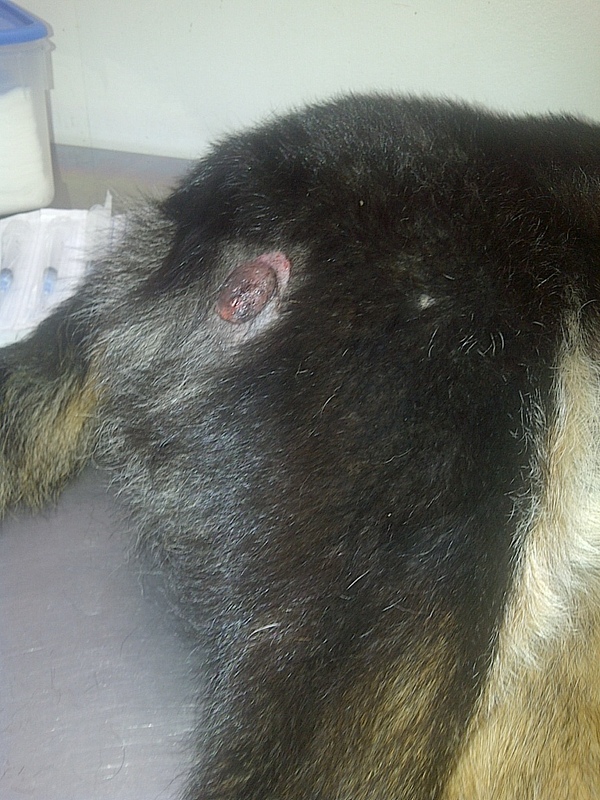 The diagnosis was Ehrlichiosis – a tick disease that can be deadly if not caught. By the time we arrived the next morning she was still doing well. She had vomited the night before but did manage to keep a small amount of breakfast down. She could also get up on her own so we walked her across the street to the park to urinate (for about 2 minutes!). It was quite a scene: I was walking Addie slowly across a busy street, Rob was trying to keep the IV in her paw from tripping her, and the vet was following with a bag “just in case”. Although she was doing better she was not ready to go home just yet. 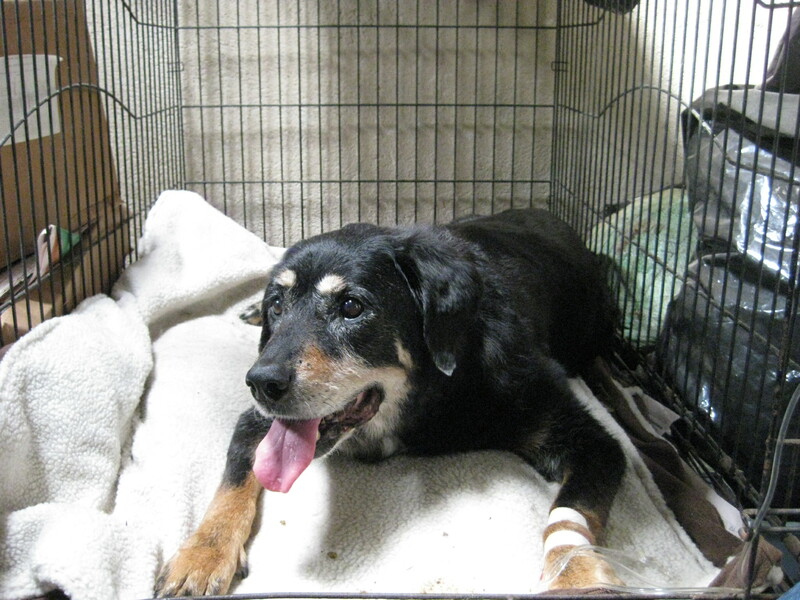 The vet kept her until about 4:30 that afternoon in order to administer more medication and to fully re-hydrate her. At that point she felt that Addie would do better at home than in her office. (As a side note: many vets here in Costa Rica work in conjunction with a feed store. Addie’s hospital room was a crate tucked in between pallets of grain!). Since her return home, she has been picky but is eating her full amount of food. She has been taking her medicine and getting up on her own. She is still very tired but has improved over Monday. She has a follow-up appointment tomorrow, and we are hopeful that she will continue to improve. At this point the main concern is liver and kidney function as those two organs are typically the most effected by the disease. This is worrisome because those are the two organs we worry about most given her age and cancer. BUT as we showed at the top of the post, her blood tests last week were good. We hope when the new results come in that the ranges will still be close to normal. On March 5th, Addie had a nice sized growth removed. She was doing pretty well recovering, but somehow the night of March 9th she proceeded to pull all 5 of her stitches out! I didn’t hear her get up in the night, and she was wearing her shirt, but somehow she managed. Of course March 10th was a Sunday, so no Dr. appointment that day! The wound wasn’t bleeding, but we felt we needed to keep a gauze pad on it anyways. With it being high on her back leg, it was near impossible to wrap it. We tried 15 times without success. In the end, duct tape worked! I know.. not a great visual, but it kept the pad on for the day! Since we needed to take her in to the vet on Monday, we also decided to try another shot of Legend to see if this one would help whereas the last one did not. At the appointment, Dr. Mario said that her incision was healing nicely and he did not need to re-stitch the wound. Yeah! He then proceeded with the additional dose of Legend. I am happy to report that the wound is almost entirely healed now. Not sure how that happened as Addie tends to take forever to heal from things, but it looks great now. AND she has been walking MUCH better the past several days. She is excited to go on her walks in the morning and wants to go longer than normal. Also, I am not sure if I had mentioned earlier, but she had a skin condition she was fighting as well, and that is 85% corrected. We still are giving her medicated baths every 2-3 days and I suspect within the week she should be good to go. Good news all around today! We never know what each day will bring for Addie, but we just take one thing at a time and do the best we can. Her quality of life is still good, so what more can we ask for? Addie has acquired many lumps over the years, with most being under her skin. However, she has had 2 external. The first has remained small for many years and all the vets have agreed that it is nothing to worry about. The 2nd one though has grown recently and become a problem. It hasn’t been excessively rapid growth, but it is to the point where it has started to bleed and we cannot seem to get it to heal. With that, we decided to take her to the vet to have him look at it closer. Our main concern for not taking her previously was that we did not want her to be put under to have it removed as anesthesia at her age is just not a great idea unless it is absolutely crucial. But this is how things go in Costa Rica: the vet just asked us to drop by sometime that day between 1 and 5pm. We arrived at 3:30 and waited for 2 other patients before us and were in to see the vet by 4. He agreed that it should be removed and he could do it with just a local anesthesia so that it would numb the area, but she would still be awake. Awesome. When can we schedule an appointment? Oh, now is fine. So we get her up on the table, we assist in the surgery by just helping to hold her while he numbs the area. We are also watching the entire removal process. He stitches her up, and she is good to go in about 1 hour from when we walked in. Wow. The cost? $20. Crazy nice hu?! Nasty looking growth on her back leg. She is on the operating table here. So, there is a chance it will grow back (as with most external growths), but she can now lay on that leg without fear of it breaking open again. He also visually analyzed the part he removed and there did not seem to be an infection and it did not appear to be cancerous. She is still favoring that leg today, but she is up and moving and a little lighter. My adorable face and Mommy can't resist my ears!